The UniBracket Camera Mount is a economical solution for connecting cameras without threaded lenses to all kinds of optics. Available in 2 sizes to fit virtually any eyepiece. The UniBracket Camera Mount is a economical solution for connecting cameras without threaded lenses to all kinds of optics. 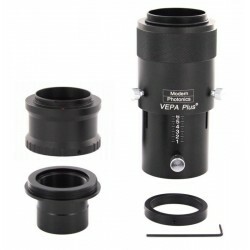 Available in 2 sizes to fit virtually any eyepiece. It can be used on most telescopes, microscopes, monoculars, binoculars, etc. Features easy to use X-Y adjustment knobs to make precise optical alignment quick and easy. Once adjusted for a particular eyepiece & camera combination it installs and removes quickly with just a twist of the large knob. The padded eyepiece clamp is non marring and the camera is held securely in place by its tripod mounting hole. Constructed of aluminum and rigid composites for a stable mounting.